Sophie Allin is CAFOD’s Emergency Programme Manager for the Philippines. Since Typhoon Haiyan hit the Philippines three years ago, she has seen communities rebuild their lives with the help of CAFOD’s local partners. Here she tells us what has been achieved with the generous donations of our supporters. This November, we remember those who lost their lives three years ago to Typhoon Haiyan in the Philippines. As communities brace themselves for new typhoons, we continue to support people to rebuild their lives and hopes. Typhoon Haiyan hit the Philippines on 8 November 2013. More than 6,000 people died and five million families lost their homes. On a recent visit, I met with some of the communities CAFOD has been working with over the last three years, thanks to the generosity of our supporters. The changes that have taken place since the typhoon struck are very visible. Trees whose tops were wiped out have started to recover, and where coconut trees once stood, the land has been replanted and used for more diverse farming. Houses have been reconstructed, and are now adorned with flowers and homely decorations reflecting the individuality of each family. But the support of CAFOD’s partners has reached far beyond just physical changes. Jennifer, who lives in the small coastal town of Basay, lost her husband in the typhoon. As I sat with a group of women in their newly constructed shop, she told me how for the first time in her life she became the sole breadwinner for her family. As she recounted the events of three years ago, there wasn’t a dry eye in the room. Our local Church partner, Caritas Philippines, has been supporting her to rebuild her life. “After the typhoon, I was desperate and distraught. I lost the will to live,” she told me. “The project breathed new life into me. I joined a women’s group who gave me support and encouragement. I took part in training and began to provide for my family and send my children to school”. She and the other women in the group told me that not only does the group enable them to earn money and live in dignity, but coming together means they can also support and encourage each other. Jennifer’s life is looking much brighter: “Now I take pride in myself, I comb my hair and put on makeup. This project has given me something to live for”. Forty-two-year-old Edralan from Palo – another coastal town devastated by the typhoon and hardest hit by storm surges, had a similar story to tell. 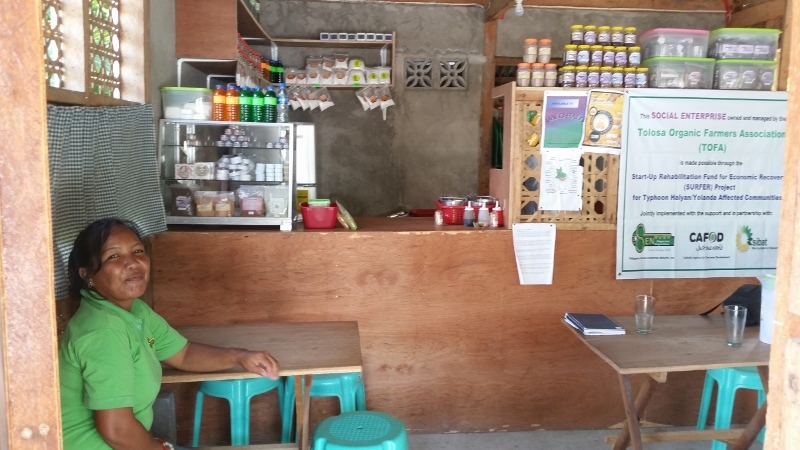 After losing her home and all means to run her brick-making business, she joined an organic farming and small restaurant enterprise, supported by our local partner, The Philippine Social Enterprise Network. Over a freshly prepared lunch in their restaurant, Edralan told me in shy, broken English, how grateful she was to the Catholic community in England and Wales. She said: “I now feel part of the community and not so alone. I have support and believe we could come together and cope with another disaster”. Joining the enterprise has ensured Edralan a regular income, and learning organic farming techniques has enabled her to grow good nutritious food for her family. Returning to normality was a priority for families after the typhoon. But it was also important to make sure that houses and schools – as well as communities – were rebuilt even stronger than before. 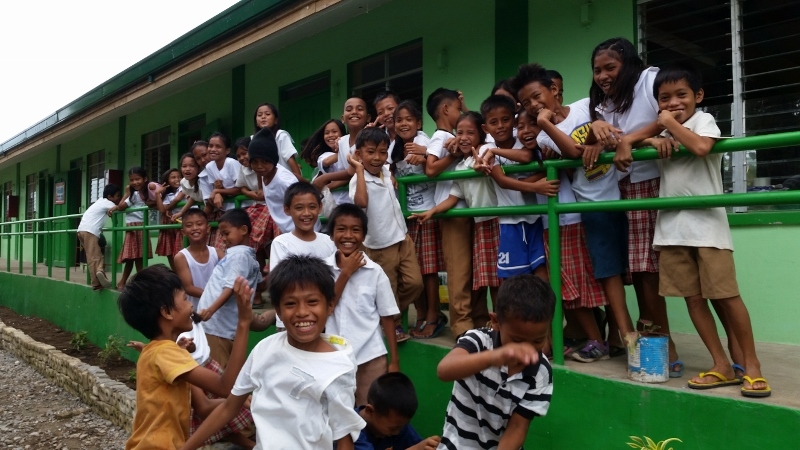 In Bantayan, one of the more than 7,000 islands that make up the Philippines, our partner has reconstructed seven schools in the three years following Haiyan. As part of this, more than 200 people have been trained in safer building techniques. And disaster reduction committees have been set up to coordinate with the local government and plan evacuation drills. It is thanks to the incredible compassion and generosity shown by CAFOD supporters that our partners could respond immediately with urgently needed food supplies, shelter, water and sanitation. Eighty per cent of people in the Philippines are Catholic, and the Catholic Church was on the frontline of the emergency response, delivering aid quickly to remote communities. In total, as part of Caritas International – a coalition of Catholic agencies from around the world – we have worked with local partners to deliver aid to more than 800,000 people in the Philippines. This year alone, the local organisations we support have been able to respond to three typhoons, supporting more communities with skills developed through learning from the Haiyan response. It moved me to meet women like Edralan and Jennifer and witness how the generosity of Catholics in England and Wales has brought hope. As Edralan so eloquently said: “Many, many thanks. The help we received continues to lift up those of us in small communities who live in poverty”.